Regardless of your herd size, intentionally managing hoof health will help ensure heifers’ feet are healthy and will sustain them through their milking years. Preventing lameness in dairy cows starts early, according to Karl Burgi, a hoof health specialist and consultant. Burgi advises farmers to look for digital dermatitis in breeding age heifers to reduce the risk of lameness. “When digital dermatitis does not occur in heifers, the occurrence in the milking herd will be minimal with good management,” said Burgi, who works with dairy producers throughout the world and consults on proper hoof care and trimming techniques. Heifers that have had a lesion once, have a 45 percent chance of recurrence. With two lesions during rearing, that number increases to 67 percent. Lameness in dairy cattle is estimated to cost between $90 to $400 per cow. Cost of treatment, decreased fertility, milk yield loss and decreased longevity in the herd are all underlying expenses of lameness, not to mention the labor costs associated with treatment. Digital dermatitis accounts for about half of all lameness costs. The key to preventing it is early detection and treatment. Burgi recommends checking heifers as they enter the breeding pen at 10 to 12 months of age. Springing heifers and dry cows should also be assessed, treated and functionally trimmed as necessary three to eight weeks prior to calving. First-calf heifers and cows should also be assessed one or two times during lactation. Comfortable freestalls that encourage cows to lie down. Secure footing. Burgi said he prefers grooved concrete. Grooves should be spaced 3 1/4” center on center, ¾” wide and ½” deep with a 90 degree edge. Effective cow cooling during periods of heat stress, so that cows lie down rather than stand and congregate on concrete alleys. Routinely use foot baths. Size foot baths correctly so cows have 3 dips of each hoof or six seconds of contact each time they walk through the baths. Footbaths should be 10 feet to 12 feet long, but only 20” wide. Solution depth should be 3.5 inches. Footbath alleys also should have solid sidewalls because cows will walk through them quickly without stopping. Keep footbaths clean and at proper solution concentrations. Copper sulfate should be at 2.5 percent with a pH between 3.0 and 4.5. Healthy hooves are good for the animals and their yield. 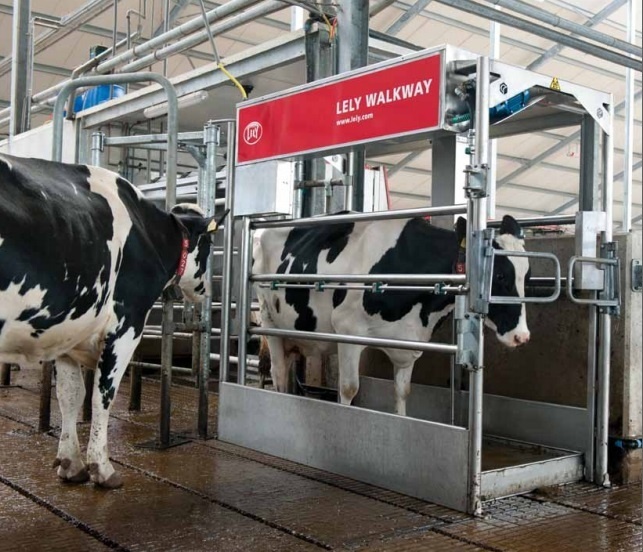 The Lely Walkway offers regular care for hooves. Safe to use: with a simple push of a button, the foot bath fills up with water and a hoof care product. The cows walk through the foot bath, thereby obtaining the efficient hoof care they need. See more information here.